The total number of GSM connections in India grew by 2.61 per cent in March with an addition of 14.5 million by all the GSM telecom providers, lower than February"s 14.7 million addition. According to the Cellular Operators Association of India (COAI) data, the total number of GSM subscribers in the country has reached 569.56 million as compared to 555 million in February. (Download from here). Despite the volatility concerning acquisition by UK based telco Vodafone from Essar Group, Vodafone Essar added 3.64 million GSM connections, taking its total to 134.5 million and a market share of 23.63 per cent. Top Indian telco Bharti Airtel notched up 3.20 million new subscribers during March, similar to its February additions, taking its total base to 162.2 million. Bharat Sanchar Nigam Ltd (BSNL) added 1.3 million new users in March 2011, taking its total subscriber base to 86.4 million. Idea Cellular best online casino added 2.7 million new customers, up from 2.51 million in February and now has 89.5 million connections, while Aircel increased its base by over 1.3 million customers to reach 54.8 million. In February, Aircel added 16.68 million new connections. Uninor continues its pace and had GSM connections, continuing its pace, while Videocon has 71,05,960 connections and STel has connections in five circles. Etisalat DB or "Cheers Mobile" has 9,68, 079 connections in 13 circles. Mahanagar Telephone Nigam Ltd (MTNL) added 20,720 new users during the month, and its total base is now 5.19 million at the end of March, 2011. 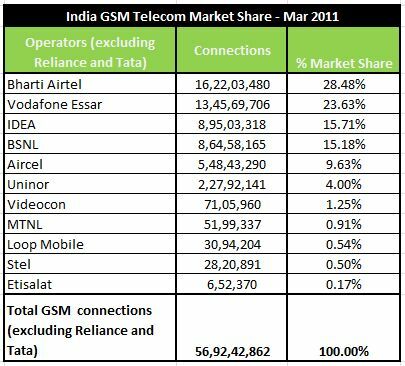 Data on Reliance Communications" (RCOM) and Tata Teleservices" GSM connections were not included.